As the UK’s original self-drilling screw supplier, our decking screws are designed and manufactured for carpenters by carpenters with years of experience in the field. We provide carpenters and tradesmen with application specific screws to complete their decking projects quickly and efficiently. 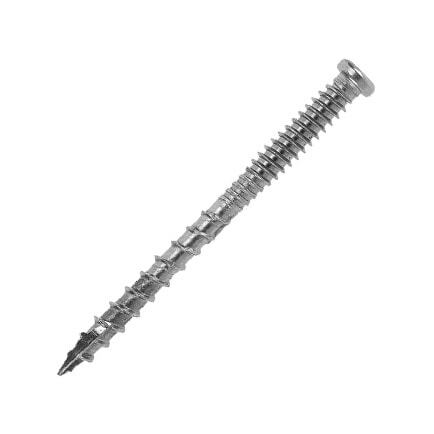 Browse our selection of carbon steel and stainless steel deck screws below. 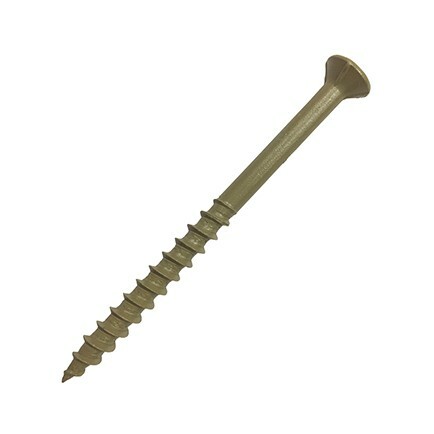 Stainless steel No.7 finishing screw - A high-quality stainless steel deck screw. You can specify these screws to come in a range of powder coated colours for an almost hidden look - from natural wood to green or even pink. 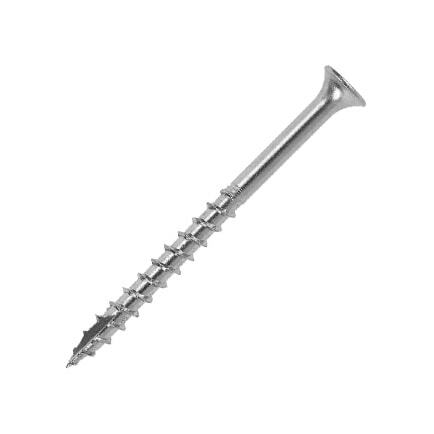 Stainless steel No.10 composite deck screw - These stainless steel deck screws won’t ruin the appearance of your composite decking as the screw heads are discreet and self-drill neatly into the composite material. They’re functional too and specifically formulated to work with composite decks without losing any of their pull-out resistance. These too can be colour matched with our powder coating process to blend into the deck. Call us or ask your distributor for more details. 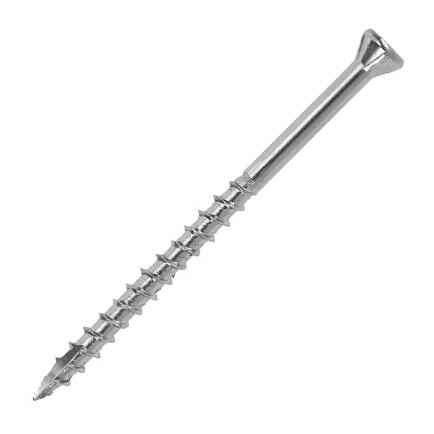 Exterior wood deck screws - Our super-strong exterior wood screws feature a self-countersinking square-drive head and are manufactured from high-tensile carbon steel - perfect for outdoor applications such as timber decking. Finally, the Multi Purpose Bugle Head is a great all-around product with a larger head for additional strength and support for timber. It is specifically designed with a thread to make installation faster and easier. Our timber screws are designed to be tough and hard wearing to provide longevity and are coated to help reduce corrosion damage, which is common with decking over time. Just like the rest of our range these self-drilling screws do not require pre-drilling so you'll be able to complete your deck in record time. View our video demonstration below! If you’re looking for a hidden deck system, you’ll want to consider the CAMO hidden decking system. There is a wide range of fastening systems available, but they struggle to compete against the CAMO when it comes to precision, ease of use and speed. It really is the fastest and easiest way to ensure your decking projects are millimetre-perfect and look fantastic, and it’s only available in the UK through the OSC Sales Ltd distributor network. The Carpenters Mate range of premium-quality self-drilling wood screws, timber fasteners and accessories are durable, dependable and are trusted by tradesmen throughout the world. With no need for pre-drilling, Carpenters Mate screws make carpentry and construction projects quicker, cleaner and more accurate. Carpenters Mate wood screws make laying flooring and decking, carrying out loft conversions, repairing roofs and erecting fences quicker, cleaner and easier than ever before. All of our deck screws come equipped with a free drill bit in each box to help you complete the job without having to go through the trouble of purchasing an extra one. However, if you need anything extra, we provide drive tools, gloves and adjustable post support anchors. Just have a browse through our products - all designed to help you complete your decking projects easier and faster. If you would like to order stainless steel deck screws in bulk or purchase a single pack of our quality screws and accessories, then you can find a local distributor here. We work with hundreds of distributors across the UK. You can also find your nearest distributor by contacting us online or calling us on 0845 241 9862.